We are a quality conscious organization which directs all its efforts towards maintaining the quality standard of the machine offered by us. 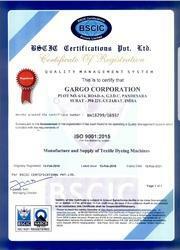 Our organization follows stringent quality testing procedures which enable us to offer textile dyeing machinery which are at par with the international standard. For a better output, we make use of superior quality raw material such as stainless steel and mild steel which are procured from reliable customers. Expert quality managers test the quality standard of the manufactured machines with the aid of advanced testing equipment and tools. We are a client centric organization that is why we always strive to achieve maximum level of customer's satisfaction. Our organization aims at executing its operations in a professional manner which results in enhanced trust of customers. Moreover, ethical business practices and client's oriented approach make us the most preferred choice when it comes to textile dyeing machinery. We also offer customized services to our clients and pack the machines as per their requirements. To ensure that they don’t face any hassle regarding the functioning of the machines offered by us, we also provide prompt after sales service. Further, we are also capable of undertaking customized stainless steel manufacturing as per the requirements of our clients. Seeing all these benefits, many reputed dyeing houses in Surat have instilled their valuable trust in us. Moreover, we are also getting orders from other parts of the country as well.